The sound of an alarm clock wakes Pee-wee Herman from his sound slumber and, within moments, he is changed from his pajamas into an ill-fitting suit, as if by magic. An elaborate Rube Goldberg machine helps him complete his morning routine. In short time, he rides down the street in his red vehicle built for one, which looks like something only a child would want. If it sounds like you’ve seen this movie before, it’s because you have, over 30 years ago in Pee-wee’s Big Adventure, the feature film debut of Paul Reubens’ now classic character. And the sequence described also occupies the first 10 or so seconds of the trailer for the new Netflix original movie Pee-wee’s Big Holiday, which begins streaming on March 18. Although Big Holiday appears to bend the limits of the word “original,” the trailer feels more comfortably familiar than exploitative, self-referential as opposed to self-plagiarizing. It’s clear that both Netflix and producer Judd Apatow are betting that fans will find the trailer’s sequences familiar. They aren’t trying to pull the wool over anyone’s eyes; they’re wrapping a bow around the reminiscent moments and shining a light on the package. While most resurrected franchises of late function as nostalgia, Big Holiday seems poised to function as a meta-nostalgic experience. Nostalgia is John Stamos’ Uncle Jesse declaring, “Damn, we all still look good” early in the pilot episode of Fuller House. Meta-nostalgia is A Christmas Story, a film released in 1983 depicting the Depression Era. Because the movie is set decades in the past, it is inherently retrospective, and so those who watch the annual marathon experience nostalgia on more than one level. Elsewhere in the Big Holiday trailer, Pee-wee enthusiastically states to another character that he doesn’t “want to go anywhere or try anything new.” It’s a moment that, perhaps unintentionally, comes close to breaking the fourth wall, with Pee-wee’s unofficial declaration to the viewing audience. Pee-wee has long since relied on recycled jokes, whether from the grade-school playground or the character’s inception with The Groundlings. Which, by the way, is just fine for those who grew up watching Pee-wee Herman in the 1980s. Ever since Reubens first announced that he was hoping to make a new Pee-wee film on The Tonight Show With Jay Leno in 1999, fans have been waiting to experience his unique brand of meta-nostalgia yet again. The years that followed contained raised hopes and false starts. At some point, there were allegedly two scripts, each playing to half of the man-child dichotomy the character so perfectly encapsulates: The Pee-wee Herman Story—a self-described “fake autobiography”—was the adult film, a dark hybridization of Valley Of The Dolls and A Face In The Crowd, while Pee-wee’s Playhouse: The Movie, was to feature characters from his popular Saturday morning show, which ran on CBS from 1986 to 1991. Both very different, yet both would have been meta-nostalgic—relics in more than one way. 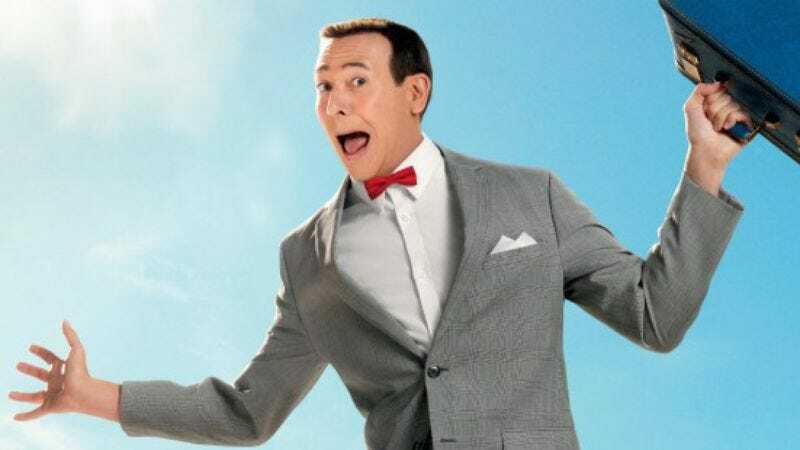 Even though those films failed to materialize, Reubens began taking Pee-wee’s comeback seriously in 2009, with the revival of his flag-setting stage production The Pee-wee Herman Show. Most Pee-wee fans had never experienced the character live, and the fact that the majority of the material would be familiar was a big plus. (A performance taped for HBO in 1981 ran for years on cable.) Demand for tickets was so high that opening night was pushed back two months in order to move the show to a larger venue. A limited engagement on Broadway followed, as well as another HBO special. The pattern was set: If the Pee-wee formula’s not broken, don’t fix it. Pee-wee’s Big Holiday finds its hero living among a group of old folks (as he does in “the other Pee-wee movie,” 1988’s disappointing Big Top Pee-wee), in addition to donning a hair net in the back of a restaurant kitchen, hitchhiking, and traveling across the country—more Big Adventure parallels. Even the film’s title itself is a callback. It’s clear that Pee-wee likes to show ownership—it’s his playhouse, his adventure, and his holiday—and that he likes things big. Much has been made online about Netflix’s recent attempts to capitalize on its audience’s hunger for nostalgic content. It’s no secret that children of the 1980s occasionally spend their disposable income reliving aspects of their childhood (as children of the ’70s, ’60s, and ’50s did in decades past); to today’s kids, Transformers, Teenage Mutant Ninja Turtles, and even the Tanners on Fuller House, seem new. So producers and movie studios are more willing to dust off those decades-old franchises than ever before. While there are no guarantees in Hollywood (looking at you, Jem And The Holograms), The Smurfs offer an easier path to success than Megamind. But Pee-wee’s Big Holiday isn’t an example of Reubens jumping on the bandwagon down Old School Lane. Instead, it marks a return to him claiming his space in a nostalgia wave he helped bring to shore over 30 years ago. Reubens and his collaborators masterfully created Pee-wee Herman’s children’s TV empire in the image of kid-friendly programming from decades past, such as Winky Dink And You, The Howdy Doody Show, and Captain Kangaroo. While puppetry was a regular sight on the big screen in the mid-’80s—Labyrinth and Little Shop Of Horrors hit theaters the same year Playhouse opened its doors—there were virtually no foam and paint characters to be found on television, save for Pee-wee’s half hour and the Muppets of Sesame Street and Fraggle Rock. To the young children and stoner college crowd watching, Playhouse was a rarity for the time, a phoenix rising from the ashes of a Saturday-morning wasteland populated by Pound Puppies, G.I. Joe, and Care Bears. Older viewers—and there were lots of older viewers—viewed him as an evocative figure, an homage to Pinky Lee and Jerry Lewis. His schoolyard taunts—“Why don’t you take a picture, it’ll last longer?” and “I don’t make monkeys, I just train them!”—made him relatable to the targeted demographic, but reminded their parents of their own childhood experiences. They were encouraged to “scream real loud” when someone (on- or off-screen) said the secret word, and indulged Pee-wee and his friends as they engaged in any number of classroom activities: arts and crafts, snack time, playing pretend, and making lots of noise for no good reason at all. Like the feature films, plot was inconsequential and fun was paramount. There was not only comfort in the familiar, but also success: Pee-wee’s Playhouse earned 15 Daytime Emmy Awards in its 45-episode run. Pee-wee Herman’s meta-nostalgic reemergence feels natural where other reboots don’t because the success of the character has always depended upon his consistency. After all, he has worn the same gray glen-plaid suit and red bowtie for more than three decades. When Reubens appeared at the 2010 Sturgis Motorcycle Rally in South Dakota in an attempt to add “World’s Biggest ‘Tequila’ Dance” to the Guinness Book of World Records, fans showed up en masse to help the cause. There weren’t eye rolls because Pee-wee was retracing his steps, there were cheers. Why would we expect anything drastically different now? As long as reboots continue to be profitable, their existence, and the critiques of their existence, is inevitable. However, the less Pee-wee changes, the more impervious he will be. Nostalgia runs through his DNA, and those same genes flow through his fans. If you think Pee-wee Herman is irrelevant in today’s society, he would likely respond with a quick, “I know you are, but what am I?”, and his fans would laugh like it’s the first time they’ve heard it.